These miniature rugged spectrometers are calibrated to measure and track laser frequency and centroid wavelength and/or total power of lasers in Watts. 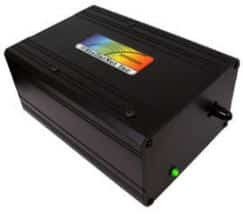 Currently, StellarNet offers laser measurement systems in the 200-2300nm range. 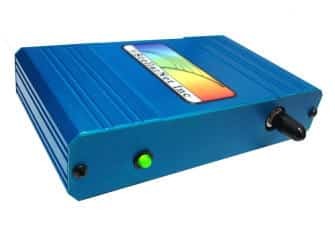 All of StellarNet’s spectrometers can be configured for laser measurement including the BLUE-Wave, GREEN-Wave, High Resolution, and High Resolution NIR spectrometer models. 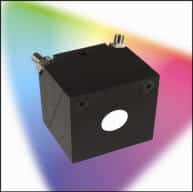 The spectrometers can additionally be calibrated with our NIST traceable lamps for absolute intensity to be used to capture laser intensity profiles and shape. Typically an integrating sphere such as the IC2 2″ or IS6 6″ integrating sphere is coupled along with a radiant flux calibration (RAD-CAL). 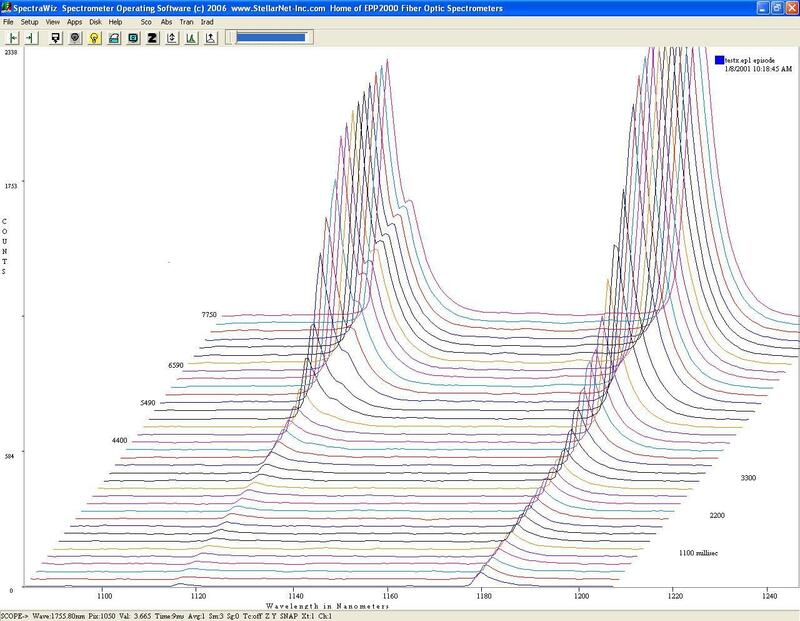 The HR spectrometers have double the resolution over standard models with the same grating. The wavelength range is reduced by the same factor. Resolutions better than 0.1nm can be achieved depending on selected model range, detector, and slit size. NIST Calibrations The factory performs calibrations for the appropriate wavelength range of your spectrometer using NIST traceable calibration lamps (calibration service such as IRRAD-CAL must be ordered with spectrometer and proper measurement accessories) Fast delivery: most system can be calibrated and shipped within 1 week after receipt of order. Absolute calibration: accuracy within 10% at detector integration setting used for calibration. Certificate available: documentation with NIST traceable serial numbers. 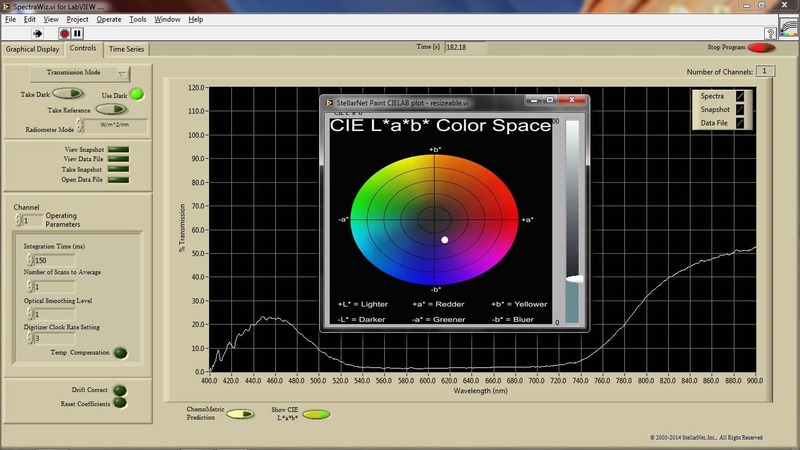 If the user has an appropriate irradiance calibration source lamp, a field re-calibration can be easily performed using the included SpectraWiz software. 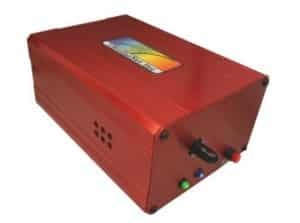 Calibrations are available for UV, VIS,NIR ranges and can be configured for spectral irradiance (W/m^2), radiance (W/m^2/sr) and total power in watt flux in Watts. 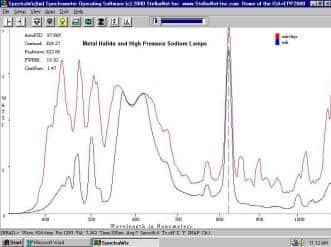 The factory performs several x-axis calibrations on all spectrometers and depending on customer application a StellarNet spectrometer may be calibrated also in the y-axis for absolute intensity measurements. 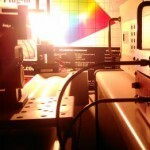 A y-axis Irradiance calibration is performed using NIST traceable lamps. 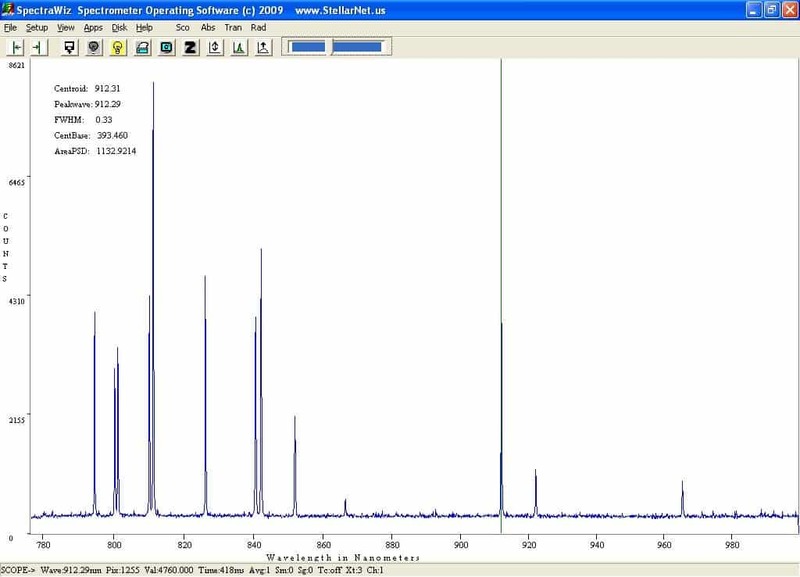 There are several available calibrations depending on your spectrometer wavelength range and slit size. 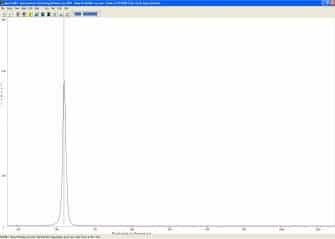 *Note- Spectrometer range can be smaller than calibration range. 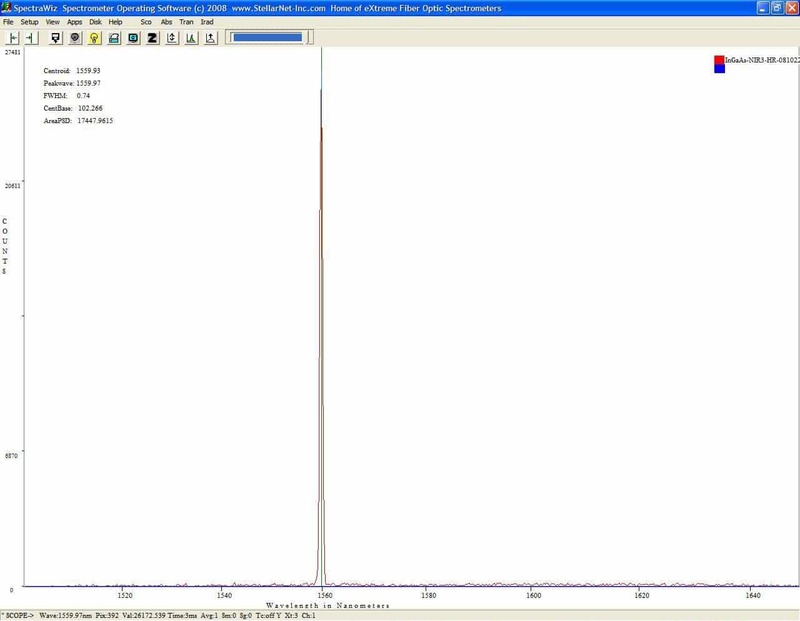 Also, IRRAD-CAL and IRRADUV-CAL calibrations can only be preformed simultaneously on BLACK-Comet concave grating model spectrometers. 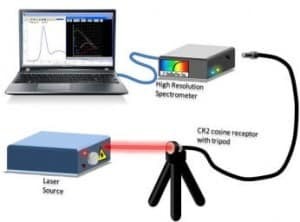 Laser Measurement systems include a StellarNet spectrometer, fiber optic cable, receptor (cosine receptors or integration spheres), and an optional irradiance calibration. 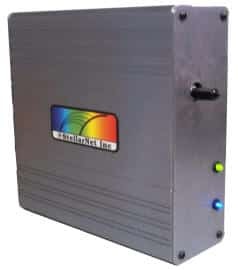 BLUE-Wave-NIR2b model spectrometer (785-1200nm).The software measures the “centroid” of laser to provide center wavelength accurately. 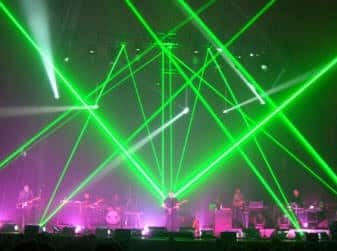 The centroid calculates the area under the laser spectrum then divides the area in half to locate the center of the spectra and thus an accurate wavelength. 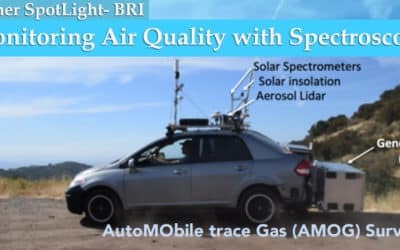 NIR2-HR HgA Emission Spectra using High Resolution NIR2-HR model spectrometer. 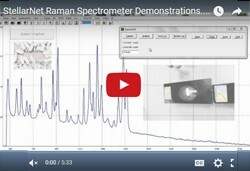 StellarNet spectrometers can be built to customer specification in most cases. 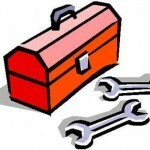 There is no extra charge for a ‘custom’ range spectrometer; however, it does become a non-returnable item. RED-Wave-NIR3-HR InGaAs-1024 model spectrometerfor the WDM band showing a laser line. FWHM = 0.7nm. 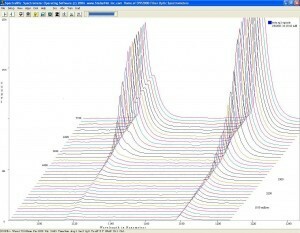 HR model Wavelength Range in nm Grating g/mm Grating Range Nm/pixel Dispersion Slit-25 nm res. 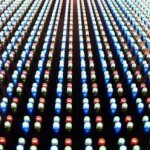 Slit-14 nm res. Slit-7 nm res. 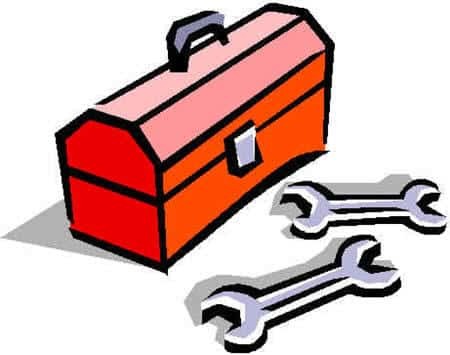 For more information about the FREE SpectraWiz Software Suite and all our other customizable full source codes and programs click on the picture links below! 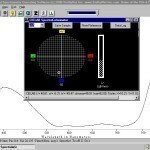 StellarNet Integrating Spheres allow direct input of laser light for total power measurement. 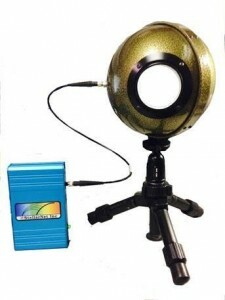 The IC2 is a 2″ internal diameter sphere with 2 SMA connectors for illumination and collection of light. Mounting tripods and other accessories are available for laser measurement. IS6 is a 6” diameter integrating sphere with a 2.0” input port, internal reflective coating, baffle system, and SMA fiber optic output. StellarNet 6″ integrating spheres are now available with several port accessories such as calibration lamps, caps, SMA-couplers, and reducers. IC2 is a 2” cube with internal integrating sphere. It has 5/8” input port and SMA fiber optic output. Another SMA input can be used for reflectance illumination. Select the IC2-TP miniature tripod for mounting the IC2 for alignment and repeatable measurement. 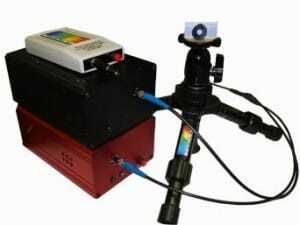 Dual DSR Spectroradiometer- StellarNet Dual DSR system pictured above uses a Y bifurcated fiber (F600-Y-UVSRNIR) to connect a BLACK-Comet-SR spectrometer and a RED-Wave NIR Spectrometer. 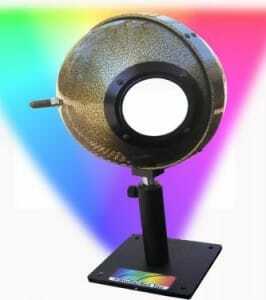 The entire system can be radiometrically calibrated over the range 200-1700nm. 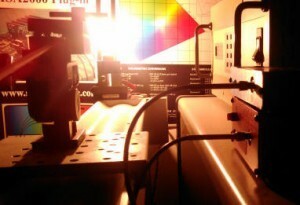 Above system pictured with Flash Capture Interface (FCI) that allows spectrometer to capture emission from flashing sources such as flashtubes and pulsed solar simulators.